Born in 1883, Adm. Bertram Home Ramsay spent nearly his entire life in the service of the Royal Navy. During, Ramsay's 29 year career in the navy he commanded a monitor, destroyer, three cruisers and a battleship, and during Normandy, the largest amphibious assault force ever collected. In 1915, Ramsay had a stroke of good luck; he turned done the opportunity to be a Flag Lieutenant in the cruiser Defiance, which was later sunk at the battle of Jutland. 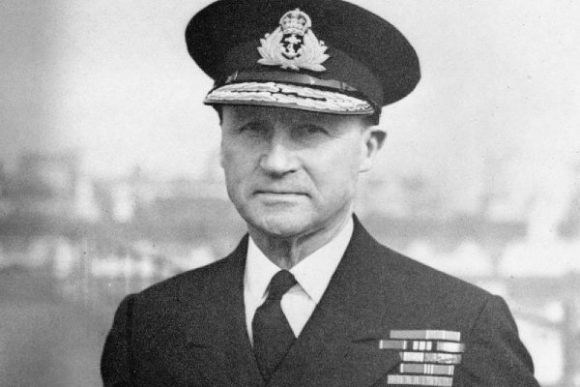 He was promoted to Rear Admiral in May 1935 and Ramsay retired for the first time in 1938, but returned to the service of his country at the beginning of WWII. One of Ramsay's first duties in the war was Operation Dynamo, the evacuation of British Expeditionary Force, along with some French soldiers, from the shores of Dunkirk. Ramsay's forces, bolstered by a number of civilian vessels, managed to save a majority of Allied forces from the German encirclement and most likely prevented a premature end to the war. Following Dunkirk, Ramsay went on the offensive. In November 1942, he led the allied fleet in support of Operation Torch, the invasion of Africa. The next year, Ramsay, landed the Montgomery's British 8th Army in Sicily and continued to provide naval bombardment throughout the successful Sicilian campaign. Ramsay's experience in commanding invasion fleets made him Eisenhower's natural choice to lead the naval forces in Operation Overlord. Despite Ramsay's concerns that the large waves on the channel would degrade the accuracy of his fleet's gunfire, the invasion was launched on June 6th, 1944. His minesweepers began the invasion by scouring the channel for mines and clearing ten channels to Normandy for the invasion fleet. After the channel was cleared of mines, Ramsay's fleet began landing men and equipment ashore while pounding suspected German strong points with gunfire. The 702 vessel strong naval bombardment fleet ranged in size from battleship all the way down to landing craft that were specially fitted with rockets. Ramsay's planning and experience made history's largest amphibious invasion possible. In 1945, Ramsay's life was cut short when he was killed in a plane crash.